The 1917 Stanley Cup Final was contested by the Pacific Coast Hockey Association (PCHA) champion Seattle Metropolitans and the National Hockey Association (NHA) champion Montreal Canadiens. Seattle defeated Montreal three games to one in a best-of-five game series to become the first United States-based team to win the Cup. The games of the Cup finals were played at the Seattle Ice Arena. Games 1 and 3 were played under PCHA rules; Games 2 and 4 were played under NHA rules. In game one, Didier Pitre scored 4 goals as he led the Canadiens to an 8–4 victory. But the Mets won the next three contests to clinch the Cup, allowing only one goal in each game. Bernie Morris scored 14 of Seattle's 23 total goals for the series, including 6 in their 9–1 victory in game four. Future Hockey Hall of Fame goaltender Hap Holmes recorded a 2.90 goals-against average for the Mets. 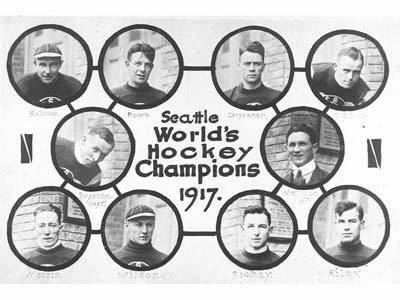 Seattle won the 1917 championship by defeating the National Hockey Association's Montreal Canadiens three games to one by a combined score of 19 to 3. Fourteen of Seattle's goals were scored by Bernie Morris (including six in game four alone).. Games one and three were played under PCHA rules, i.e., seven players per side, forward passing in the neutral zone, and no substitution for penalized players. Games two and four were played under NHA rules, i.e., six players per side, no forward passing, substitutions allowed.. The Seattle 'Mets,' as they were affectionately known, became the first American team to win the Stanley Cup. This altered one of Lord Stanley's original conditions for the Stanley Cup--that the winner be from the Dominion of Canada. The champions of the Pacific Coast Hockey Association were challenged by the reigning Stanley Cup champions?the Montreal Canadiens. The best of five series saw Montreal win game one, but Seattle came back to win the next three. Seattle scored 23 goals in four games, limiting the Montreal Canadiens to 11 goals, including only three in the last three games. 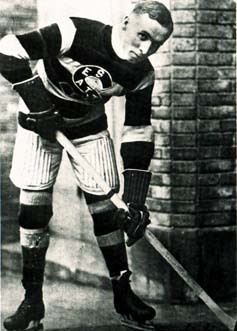 Bernie Morris of the Metropolitans scored 14 of the Seattle goals, including six in the final game, a 9-1 Met victory. An early 1-3 start did not bode well for the Mets, but they quickly rebounded to win six of their next eight, to sit at 7-5 at the mid point of the season. By time the last game of the season rolled around, Seattle needed a win on the road against defending champion Portland to win the title outright. A train car full of Mets supporters headed down to the Rose City to watch their team come away with a 4-3 to finish the season 16-8. Bernie Morris led the league in scoring with 37 goals and 17 assists, and Foyston finished third with 36 goals and 12 assists. The NHA champion Montreal Canadiens made the trip west by train to face Seattle for the Stanley Cup. The entire series was to be played in Seattle, and the first game sold out in a matter of hours. Over four thousand fans packed the Ice Arena for game one, but a travel weary Montreal still came away with a 8-4 victory. That was Montreal's only taste of success, however. Seattle went on to win the next three games, outscoring the NHA champs 19-3 to become the first US team to win the Stanley Cup. Bernie Morris led the team with 14 goals (including six in game 4) during the series. Games 1 and 3 were played using PCHA rules (7 players per side, forward passing in the neutral zone, and no substitution for penalized players) and games 2 and 4 were played using NHA rules (6 players per side, no forward passing, substitutions).